Former University of Tennessee winningest coach Pat Summitt. KNOXVILLE, TN—America lost another icon in the sports community on Tuesday, June 28. Pat Summitt, the winningest coach in Division I college basketball history (men or women) with 1,098 victories, passed away from early onset dementia, Alzheimer’s type. She was 64. Her son, Tyler Summitt, issued a statement Tuesday saying that his mother died peacefully at the Sherrill Hills retirement facility in Knoxville surrounded by those who loved her most. Summitt said in the statement that a private ceremony would be held in Middle Tennessee, but a date or exact location was not disclosed. Erin Freeman, who has been acting as a spokeswoman for the Summitt family this week, confirmed with The Tennessean that the funeral took place Thursday in Clarksville, Tennessee. Coach Summitt led the Lady Vols to eight national titles in her 38 seasons at Tennessee. She was named the NCAA coach of the year seven times. 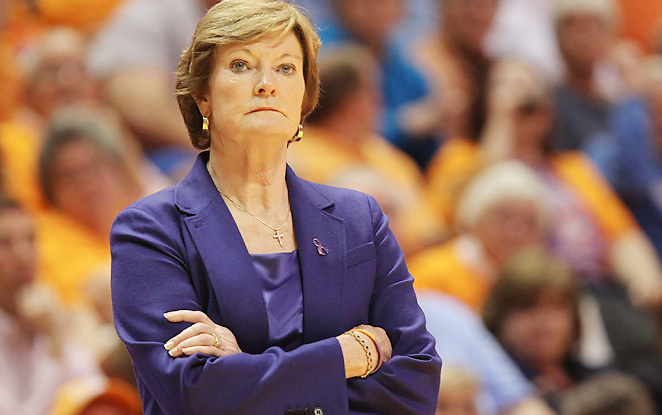 She also took the Lady Vols to 22 Final Fours (18 NCAA, four AIAW). Her teams won 16 Southeastern Conference tournament titles and made 31 consecutive appearances in the NCAA tournament. A public ceremony to celebrate the life of Coach Summitt is scheduled for July 14 at 7:00 p.m. at Thompson-Boling Arena on the University of Tennessee campus.